Walt and Virgina Bagley at their home, what is now known as Prairie Pines. In 1959, University of Nebraska, Lincoln (UNL) Forestry Assoc. 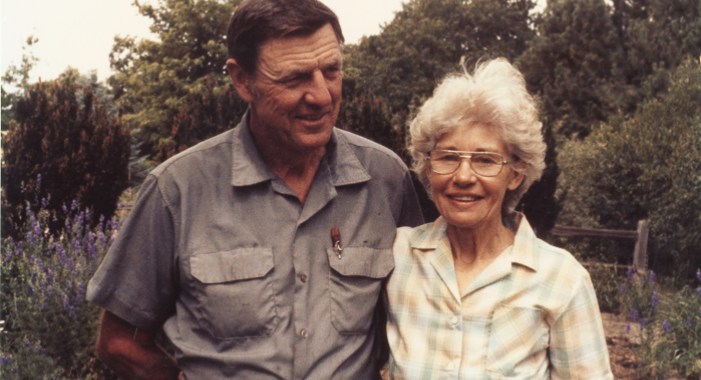 Professor Walter Thaine Bagley and wife Virginia purchased the 145 acre row crop farm with a 10 acre native prairie, that is now the Prairie Pines Nature Preserve. They transformed the farm to woodlands, windbreaks, grassland and wildlife habitat with diverse trees, an arboretum and reclaimed grassland. It became the first “choose-and-cut” Christmas tree farm, the first home for Raptor Recovery, and the first Conservation Easement in Nebraska. "Sustain a habitat for all living things through conservation, education and experience to promote a lasting connection with the natural world and its resources."